In 1956 Lejaren Hiller, a composer born chemist, suggested that a computer, properly programmed, it could be used as a support tool for composing music. From this hypothesis it was born an experiment, conducted in collaboration with the mathematician Leonard Isaacson, whose result was the string quartet Illiac Suite. 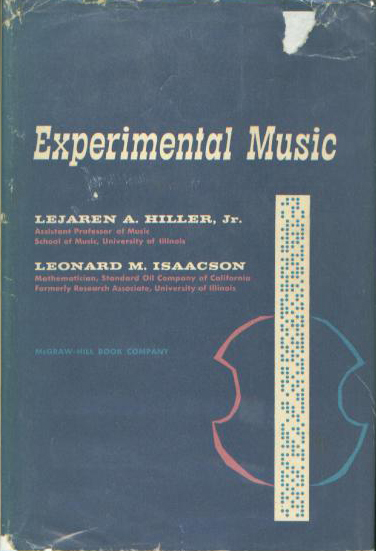 Three years later, after finally opted for a career in music, Lejaren Hiller, with this book, carries an account of that activity through a pathway that tells the many aspects that have characterized the development of this experiment. A path that starts from the cultural models and theoretical reference, the Information Theory in the first place, to dwell on the technical issues, and technology, before entering in the four experiments that will return the musical material constitutive of the four movements of the final composition. Hiller tells the methodology, carried out through a careful selection process and validation of musical elements, focuses on the variations made ​​to each experiment, tells of the music analysis carried out on the musical repertoires of reference (also made ​​reference to the treaty of Joseph Fux‘s Gradus ad Parnassum) , enters on specific computer issues, analyzes the Monte Carlo algorithm, consider the other possible applications of information technology in the field of music, plays a similar report of the activities carried out in the fifties (in other centers, in other countries), and finally leaves us the score of the finished work. The level of detail achieved by Hiller is remarkable, in a book on which the weight of his scientific training is not indifferent; training that leads him to treat an act of creation, composition, like any other laboratory experiment. I don’t remember a book in which the emphasis on the experimental is more pronounced than that place on the music. And I think this gives the book of Hiller and Isaacson’s own charm that belongs to all those pioneering activities, experimental – sometimes improbable – which lie mostly in a time getting away. ← Create your loops, for free.